I wish I was a Canner, alas, I am not. Why then, did I purchase 20 pounds of pears?! I’ll tell you why; because I love canned pears! One of these days I will have to brave the world of home canning but that day is not today as I do not have a canner or the jars or the patience to learn something new. What do I know? Jam. I know jam. Not many people know that Pear Jam is simply the best! You don’t find it on grocery store shelves but will find it in quirky little shops in farming communities. 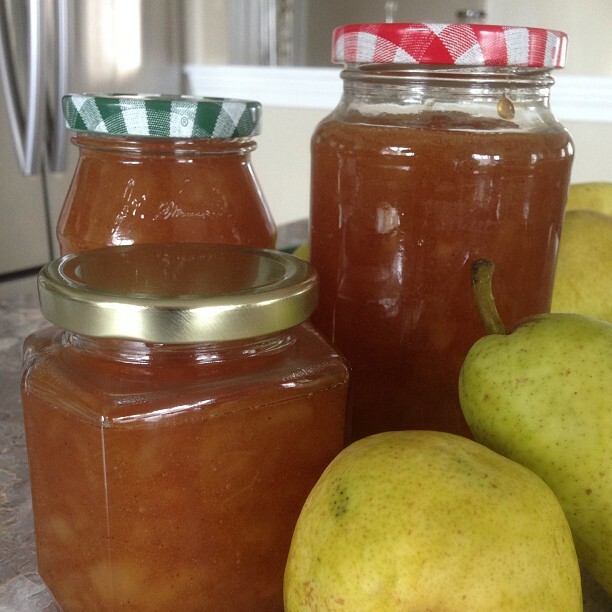 I love the way the house smells when I make pear jam. I like the way pear jam looks in the pantry. I like the gorgeous colour of the stuff. I could eat it straight out of the jar but I am a grown up now and grown ups don’t do that, right? Peel and chop pears into 8cup measuring cup. Pour into large stainless steel pot. Stir in sugar, cinnamon and cloves; bring to a boil over medium heat. Reduce heat to low and simmer, uncovered, stirring occasionally, for about 60 to 90 minutes. Stir in a splash of vanilla. Remove the jam from heat, stir and skim off foam for about 10 minutes to prevent floating fruit. Ladle jam into hot, sterilized jars, leaving 1/4″ headroom. Wipe rims with a clean towel and seal. Allow the jars to cool on a clean towel before storing in fridge for up to 6 months for unopened jars. If you want to keep jam in the pantry then you will need to process your sealed jars in a boiling water canner for 10 to 11 minutes. Remove from canner and allow to cool completely on clean tea towel before storing in a cool, dark place. * I didn’t using the canning process because, quite frankly, I don’t see this jam hanging around for very long! I will give some away and keep some in the fridge.